... the sort of simple gesture which can transform reception into hospitality and ensure guests feel truly, open-heartedly expected, prepared for and welcomed. Welcomed and also challenged: as one sister murmured: Women of the heart... that gives us a lot to live up to... and indeed it does - not just for 24 hours, or when we're in good company, but for all of life and mission, and for all of our struggling, hope-filled living of our ideals and passion. And now, already, it's the First Sunday of Advent, a time of waiting and preparation, of creating and clearing a space for Christ, in an attitude of eager expectation. As I prepare my Advent wreath I find myself reflecting on welcome and expectancy, on preparation and the simple gestures of genuine hospitality. So now I ask myself: what simple things and space-creating can I do, what sign would I make, to ensure Christ knows he is truly, open-heartedly desired and welcome into the home of my heart...? 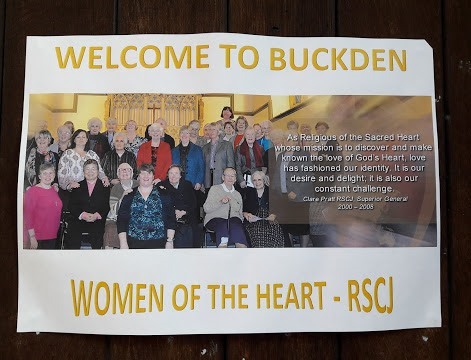 I am glad you felt welcome and enjoyed the stay at Buckden Towers.